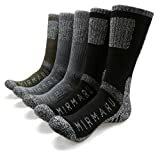 Best Hiking Socks 2019: Ask any seasoned hiker the one thing that any hiker should always carry on such a trip and chances are they will say its the socks. There’s no denying that a pair of great hiking socks can either make or break a hiking trip. In case you are looking for the best hiking socks of 2019, you have come to the right place. We have tested the best pairs currently available and have decided that the following models are probably the best buys right now. Many people, usually those new to the trekking and hiking circuit, feel that socks are of concern only in cold climates, and in mountaineering. They could not be farther from the truth: a good pair of hiking socks can protect your feet against blisters, microbial infection, hotspots, as well as against extremely low temperatures, preventing hypothermia. Now, we have already discussed the best hiking shoes; its now time to talk about the top hiking socks of 2019. The following list of best-hiking socks is arranged in no particular order. We have simply ensured that you find a wide variety of products on this page. Darn Tough is a brand that has been making all the right noises in the trekking and hiking community. In the past, if you canvassed some of the most experienced hikers, 8 out of 10 would have said that their favorite pair of socks were manufactured by Smartwool. Although the latter brand is still on the list, the Darn Tough pair will be your handy friend for any sort of hiking or backpacking trip, in even the most inclement of weathers. This is the best hiking socks overall of 2019. Like all the models from this brand, this one too is made in Vermont and comes with a lifetime guarantee. This guarantee is unconditional. Manufactured using 67% Merino Wool, the socks are automatically rendered with antimicrobial properties, meaning that even if your feet are sweaty, no infection will arise and you will be able to avoid smelly feet. These socks dry rather quickly and are also easy to identify thanks to their full cushion nature. These socks have proven to be extremely durable and never failed to disappoint us the last time we used them on the Appalachian Trail. The foot’s arch has an elastic feel to it and the light-to-medium cushioning that is provided to the foot and the shin is something that we keenly appreciate. The heels and the toes have some serious reinforcements. Overall, considering the fact that the seamless construction lends an all-day support to the socks, these are our go-to socks for nearly every season. Available color options include black, gray, and brown, as well as more recent variants in tan and green. Cushioning provided has been derided by some high-altitude climbers. 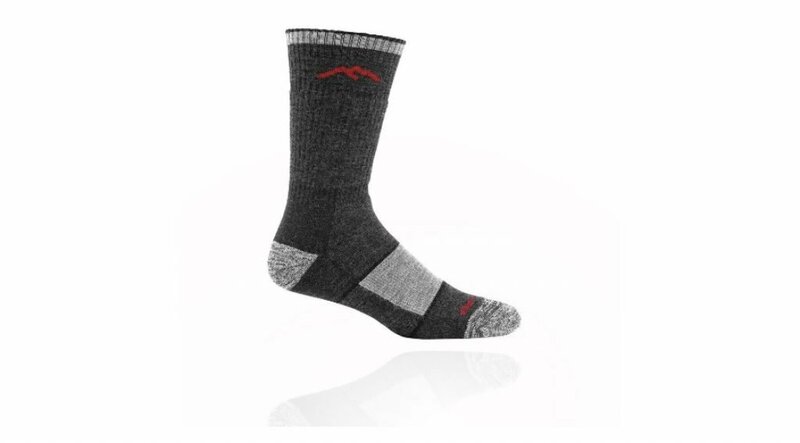 Universally considered to be one of the perfect hiking socks, this pair is marked by its durability and is further bolstered by the fact that DT (the brand’s initials as referred to in hiking circles) provides an unconditional lifetime guarantee. We have traveled to great distances wearing these socks and we have never been disappointed. A must-buy if there ever was one. Arguably, no best hiking socks list can be completed without a Smartwool model. In this case, the second best hiking socks of 2019 turn out to be the Smartwool PhD Outdoor Light Mid Crew Socks. While the mid-crew nature essentially means that the socks are located just beneath your ankle, the ‘light’ in the name indicates that these socks are ideal for backpacking as they are relatively lighter than most comparable socks. Smartwool’s PhD range is meant for durability and comfort. This pair is also extremely reliable when it comes to covering great distances. Last month, we were on a trip to South Sister, Bend, OR. We found that these socks were extremely lightweight, cushioned, and durable. The 57% Merino Wool, 40% Nylon, and 3% Elastane construction ensures that the socks have three-material support which also provided innate antimicrobial properties. These properties are of greater significance when one is trekking in slightly warmer climates when the feet get more sweaty than normal. The virtually seamless toe that this sock has ensures a comfortable and a snug fit. The arch of the foot has greater support while there are extra layers of cushioning just under the heel and the forefoot. Given that these socks are superbly knit and dry ever so quickly, we believe that a pair of these socks will eventually prove to be a close competitor to the best of the best. Overall, this is one pair of socks which will satisfy all your demands from a hiking sock. It will be your friend on any terrain and the snug fit will ensure that you never even feel as if you are wearing socks. We have been using a pair of Smartwool PhD Mid Crew for some time now and we have enormously benefitted from using it. A very good buy, even if the price tag can seem excessive at times. The apparent ROI is totally worth it. A perfect match for through-hikers and day-trippers alike, the Smartwool PhD Outdoor Light sock packs some serious trail power! Mid-crew sock in a wool-nylon blend. This is the best crew hiking socks of 2019. This is a medium cushioned, crew-cut sock designed and manufactured by CEP. This pair of socks is set apart by its fantastic fabric, which is a synthetic in nature. It is a combination of wool, silk, and polyamide which sets apart this pair as it offers unparalleled comfort with excellent breathability and ease of use. The Dynamic+ Outdoor Merino model boasts CEP’s signature and proprietary graduated compression design which improves and boosts blood circulation as claimed by the company. In this way, the socks are slightly better and more advantageous to use especially when the users are at a high altitude. At higher altitudes, the lack of gravity forces the blood circulation levels to taper out; this is countermanded by the new technology. It is thus a pair of very scientifically designed socks. Such a technology also prevents the feet from swelling. CEP has evidently put in a great deal of time and effort in making this pair as comfortable as possible. Of special mention is the anatomically padded cushioning, something which we keenly appreciated last time we used it on the Appalachian Trail. The miles simply seemed to melt away. 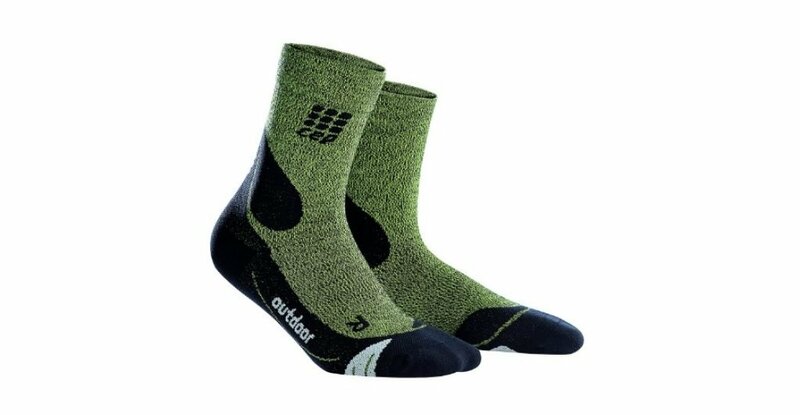 The Merino wool that is used in the construction ensures its own antibacterial nature and the socks are superbly breathable. Both the ankle and the metatarsal heads are well-padded ensuring a comfortable long distance trek. The composition of the sock’s material also aids in heat management. CEP has clearly brought in its A-game to this list of the best hiking socks of 2019. It has incorporated both technology and manufacturing efficiency in making what is truly a spectacular model. This is the pair of socks that you can use in case you have any feet or ankle-related problems and you intend to climb to a certain altitude. CEP Dynamic+ actually makes hiking look rather easy. CEP Mid Cut Merino: Fits below the calf for a crew length height. Tough, durable compressive yarns increase blood circulation, reducing foot and ankle swelling. Outdoor Merino is perfect for hiking, trail running, trekking, and outdoor training. Support Socks: Expect a custom-like fit that eliminates friction, preventing blisters and rubbing. Padded cushioning optimizes comfort and prevents hot spots. 4-inch cuff height provides true ankle stability, preventing shin splint pain and injury. Compression: Medical grade 15-20 mmHg compression hugs your foot and arch while graduated compression supports your shin and ankle, increasing blood circulation by up to 40%. The best outdoor sock for maximizing comfort, endurance, and pain relief. Comfort & Quality: CEP's finest merino wool blend is lightweight and breathable, keeping your skin dry and comfortable. Anatomical foot padding hug your feet for a wrinkle-free, athletic fit. CEP Trail Merino is the best trail running sock, period. Whether you are going for a short trek or a pretty long-drawn trek, this is a pair you can use anytime and anywhere. On our list, these are the best lightweight hiking socks. Manufactured using the traditional formula of 67% Merino Wool, 32% Nylon, and 1% Elastane, these socks blend an aesthetic design and modern technology to bring up a pair which is as unique in its functionality as it looks. To be very honest with you, we did not spend too much time in these socks. What little time we did spend wearing these, however, impressed us enough to include them on this list. 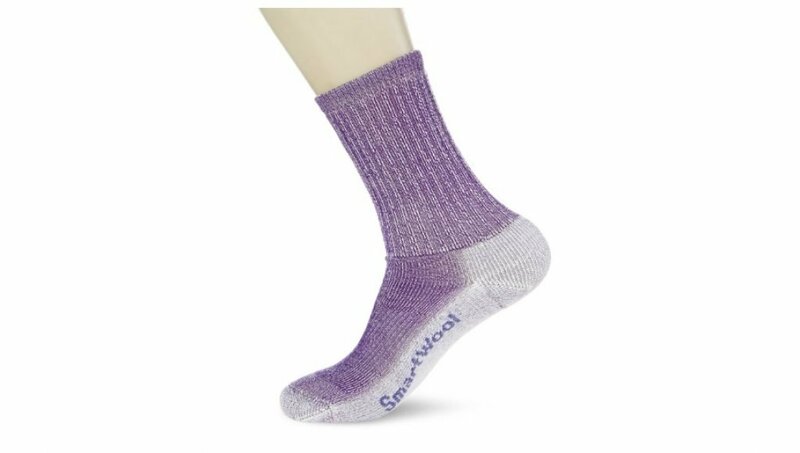 This lightweight sock is also eminently breathable and the inbuilt antimicrobial nature helps prevent any residual bacterial effect. The flat knit toe seam is something that we greatly appreciated. Available both for men and women, the men’s variant has 69 percent Merino wool, which makes it slightly more efficient in all the necessary aspects. The flat knit toe seam helps prevent any bunching or rubbing wrong as far as the socks themselves are concerned. The elastic arch brace is ably supportive of the wearer’s feet and the entire sock is lightly, but effectively, cushioned. These are also some of the softest socks on this list and dry up rather quickly too. Overall, this can also qualify as the best women’s hiking socks on this list, although the model is strictly unisex. These socks probably have the widest color range among all of the comparable socks. The men’s variant includes brown and gray neutrals while women can choose from purple, blue, pink, and red. Smartwool once again demonstrates why it is considered and regarded so highly. This is the pair that we recommend to many newbies in the hiking and trekking community. While it is very comfortable and lightweight, do not expect to go mountaineering in these socks: they have far less cushioning to that end. Overall, treat yourself to a true four-season trekking sock with this pair. 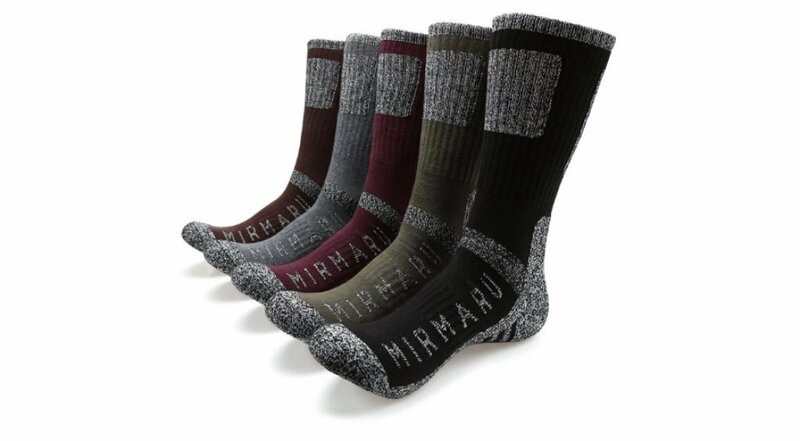 MIRMARU makes it to our list as the best budget hiking socks. We say this because this item comes with five pairs of socks in one pack, which, initially, might lead to many users questioning its quality. However, we tested these socks with a vigor and we found that no, the company has not compromised on quality. This also goes on to show yet again that quality and quantity need not be two opposing forces. One of the first things that we noticed when we opened the package was how well-designed the socks were. 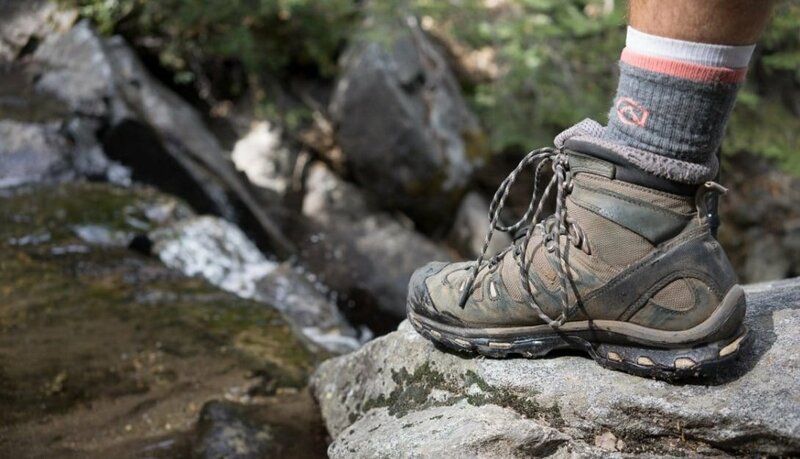 Unlike many of the top hiking socks of 2019, these pairs are manufactured with slightly different materials: 55 percent cotton that also has a polyester and spandex blend. While the spandex ensures elasticity and durability, the cotton ensures superior breathability. Such a mixture of components ensures that the socks do not get loose over time and start to get stretchy. Besides, the underfoot of these socks have also been heavily reinforced so that these socks can withstand the test of heavy and arduous treks over uneven terrains. One of the aspects that we liked the most was that the arch has a slight compression in it: this ensures that the socks retain their grip on the feet and that the circulatory system of the body is complemented from outside. Most users have stated that wearing these socks got rid of their blisters, to speak nothing of the comfort that they provide. Too thin and too narrow for many customers. From a holistic point of view, the MIRMARU Multi-performance socks are something that we keep as an alternative to our main pair. Despite being budget propositions, these socks have outshone some of the closest competitors and have made it to our list. These socks are also useful for wearing every day even as non-hiking, non-specialized socks. Clearly, MIRMARU has us sold. BLENDED FOR STRENGTH & DURABLILITY : Made of 55% Combed Cotton, 40% Polyester, 2% Spandex. Socks are designed to keep your feet warm and dry during the rigors of trekking the earth's wild place. They are Strong and durable socks. Wigwam is a brand whose products have stood the test of time as far as trekking and hiking equipment is concerned. These socks are unisex products and are the best synthetic hiking socks of 2019. Unlike most of the comparable socks, these socks are manufactured using 100 percent spandex. 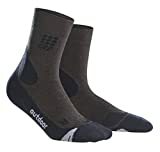 The construction is also rather unique: with 40% Olefin, 20% Stretch Nylon and 4% Lycra Spandex, this all-synthetic sock offers the best waterproofing option on this list. This means that you can cross a river in these socks and reach the other side with your feet still dry and warm. These socks are quick drying ones and the moisture wicking capabilities are second to none. The moisture is wicked away from the feet leaving them warm and dry. Clearly, Wigwam has a winning proposition. Besides, the company has also provided excellent mid-weight cushioning for the underfoot while the socks themselves have an excellent toe closure feature. 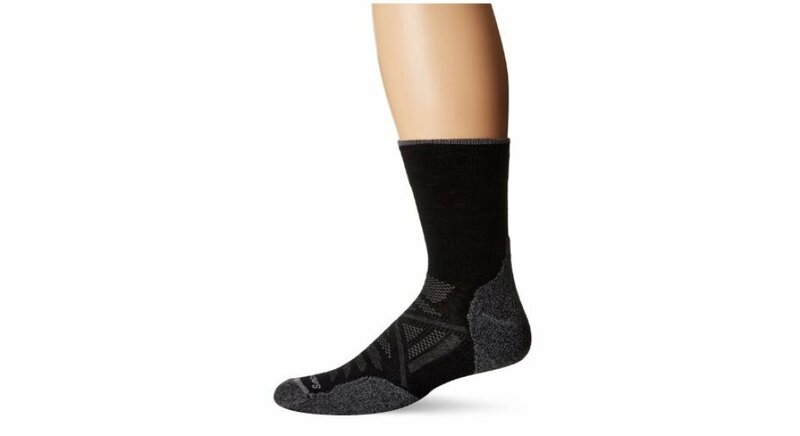 In order to be useful for multi-day hikes and treks, these socks have also been provided with a very comfortable Achilles cradle which is immune to abrasions. The toes have been paid special attention and it is likely that most users will remain blister-free in these socks.We do have a word of caution, though: do not try and use these socks at extremely low temperatures. The moisture wicking capabilities drop with the drop in the temperature and the feet will go very cold, very soon. A variety of neutral colors make these socks extremely fetching. Keeping in mind the fact that these socks are able to keep your feet cool in the summer and warm in winters, and also considering how fast these socks dry, it is imperative that you give these socks a try at least once. Remember that these socks are not meant for low-temperature usage; that is the only drawback that they have. Otherwise, a great pair overall. Behind every great purchase is a greater buying guide. These guides list out exactly what criteria need to be looked at before making a purchase decision and also lists out the essential features which the end product must fulfill. We have a standardized list of features which act as buying advice for the best hiking socks of 2019. Without much further ado, let us look at them. Barring the ones which are manufactured with synthetic materials, you will have noticed that most of the socks on the list are made with Merino wool. Now, you may ask what precisely this is and what makes it so special. Well, this is a specialized type of wool which is reared from a highly prized type of sheep which inhabit many of the most inhospitable locales in the world. One of them is the Southern Alps in New Zealand. Living in such places makes these sheep highly adaptable and this is reflected in their wool as well. Unlike older types of wool, Merino wool does not itch. You will also notice that most of the socks have a Merino wool content of between 50 and 80 percent. These are the ones you should go for. So, when purchasing a pair of socks, ensure that this minimum requirement is maintained. These factors are essential when one considers hiking and trekking in extremely cold climates. Remember that sock manufacturers design their products based on a wide variety of climatic considerations. The overall thickness and insulation are also factors that need to be kept in mind. As you have seen, these socks are divided into weight categories as well: ultralight, lightweight, midweight et al. Each of these socks caters to a certain external feature. What we mean is that the socks best for hiking in Utah may not be the same ones that you use on the Appalachian Trail. Ensure that you buy the socks which offer proper insulation and thickness depending on where you are going. Proper research on the trekking arena is a must. This factor is more important than you think. You will have noticed that on this list we have a mixture of different heights of socks. 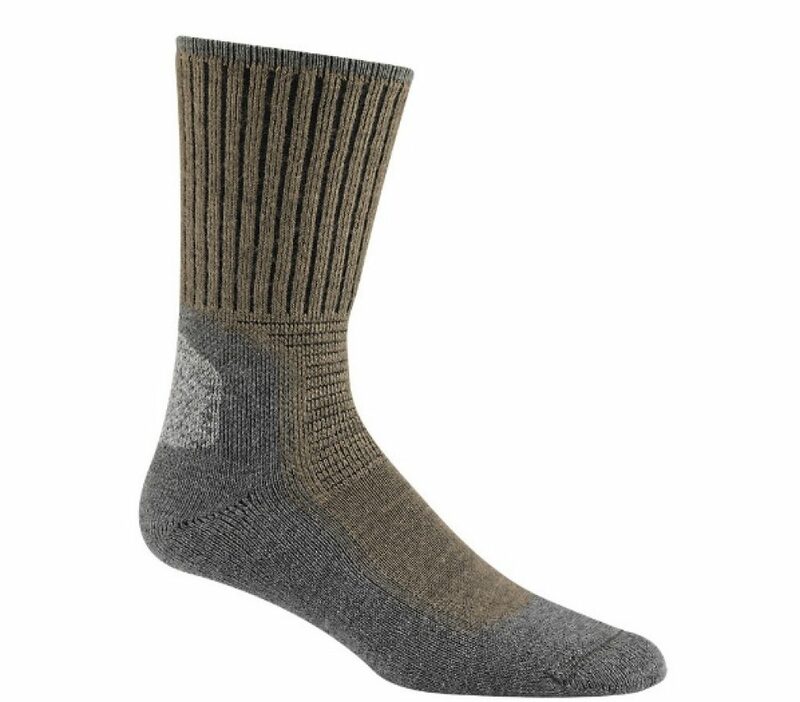 The most common hiking sock height is the crew style where the tip of the sock extends 6 to 8 inches above the normal heel and also some inches above the hiking boot. In our opinion, this is the ideal sock height as it provides an additional layer of insulation besides the hiking pants, some of which are pretty thin. On the other hand, the quarter hiking shoes do cover the heel and the ankle but are not as big as the crew socks. We know of many minimalist hikers who would do anything to avoid crew length socks but will amicably settle for the shorter ones. We leave the choice of the length to you; only remember that too high a sock will result in excessive sweating. Obviously, as with every other camping or hiking equipment, these socks too need to provide both comfort and durability. These two factors must complement each other and must not contradict one another. Brands like Darn Tough and Patagonia provide both these features as do many other lesser-known brands. So, in our opinion, you should try out the pair of best hiking socks before you make a purchase decision. In this way, the name of the brand will not be the only influencing factor and the product will be judged purely on its merits. On any trekking and camping trip, one simply does not have the time or the space t care for their shoes. Hence, the ideal hiking socks should be the ones which do their business with minimum fuss. Most of the Merino wool products are recommended for washing in cold water as well as line drying. Machine drying these socks should be avoided as it shortens the lifespan. Choose a pair of best hiking socks which ensure minimum pilling and shrinkage when thrown in the dryer. This should keep you on track to having the best hiking trip possible. Now that you have a lowdown of the best hiking socks 2019, we encourage you to choose the pair best suited for the trip you have in mind by wearing them first. Remember that brands aren’t everything; some of the lesser-known companies make perfectly great hiking socks as well. We will keep on adding to this list, so watch this space.